The Lap Paks from Home School in the Woods give your students a hands on approach to History. Rather than just reading about a time in our country, we are able to read, make mini booklets and dig deeper into areas we have an interest in. 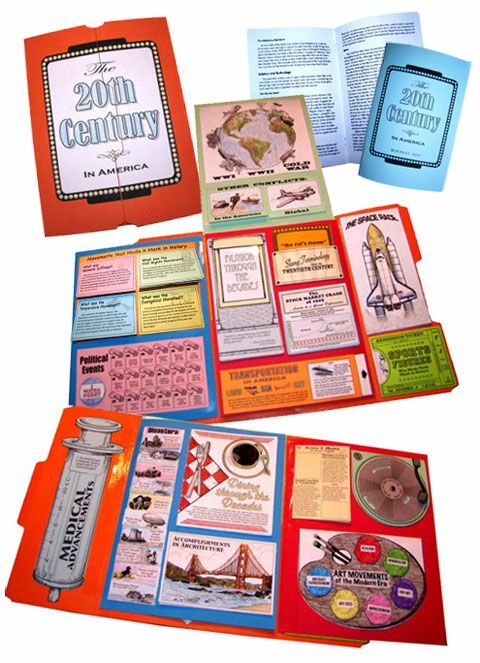 We reviewed The 20th Century in America Lap-Pak which is completely focused on the highlights of the 20th Century we learned about the presidents, wars, medical advancements, sports, transportation, arts and more. A great variety of different interests to please all types of students. I typically do lap books with my younger children and hadn't thought of incorporating it with an older child. This particular lap book is geared for grades 3-8th. I utilized it with an 8th grader and he was able to get in there and get creative with some of the 22 projects included. I did receive a download copy of this lap book. Most people are now pretty techno savvy, I on the other hand am still pretty dysfunctional. I did struggle with where I downloaded it, and if it was saved properly. Not any fault of the product, just a suggestion to purchase the CD if you are anything like me! All the information is given on how to fold and create each of these mini booklets, including a photo of what the finished project should look like. I think Home School in the Woods is an amazing company and we have had the blessing of using their timelines over the coarse of our studies. A great company that helps bring history alive. Click on the Banner below for a look at some of the other great products that Home School in the Woods has to offer as fellow Crew mates reviewed a variety of them.